Foreign Ministry and the National Security and Defence Council are jointly working on this problem. Ukraine will challenge in court the imposed by Russia shipping restrictions through the Kerch Straight in connection with the construction of the bridge, Deputy Minister of Infrastructure Yuriy Lavrenyuk. "The Ministry of Justice, within the framework of the existing lawsuits against Russia, separates the problem of blocking the Kerch Straight and imposition of restrictions on shipping. The lawsuit will include the losses sustained by Ukrainian Mariupol and Berdyansk commercial ports," the deputy minister told a meeting with trade unions of sea and river ports. He said that the issues created by the construction of a seaport in Reussia-occupied Kerch, which caused the concerns of trade unions of the Berdyansk port are being addressed by Ukrainian foreign ministry and the National Security and Defence Council. "This is a global, political and complex issue, but we will definitely resolve it," he said. 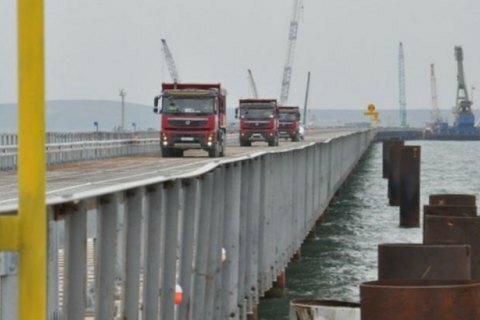 In June, Russian Ministry of Transport announced a 23-day closure of the navigable part of the Kerch Strait (Kerch-Yenikal Canal) in August-September for the construction of the arches of the bridge. Last September, the United States included in the list of sanctions seven Russian companies that are associated with the construction of a bridge across the Kerch Strait.